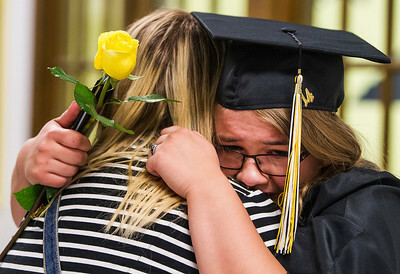 Kyle Grillot - kgrillot@shawmedia.com Foreign exchange student Thorey Aradottir cries talking about staying in touch while hugging junior Katlyn Williams after the Harvard High School commencement ceremony Tuesday in Harvard. Aradottir met Williams in choir during her time at Harvard, and will soon go back to Iceland where she plans to go to attend a university. Kyle Grillot - kgrillot@shawmedia.com Dr. Lauri Tobias (left) adorns graduate Angel Sanchez Hernandez with an honors medallion during the Harvard High School commencement ceremony Tuesday in Harvard. 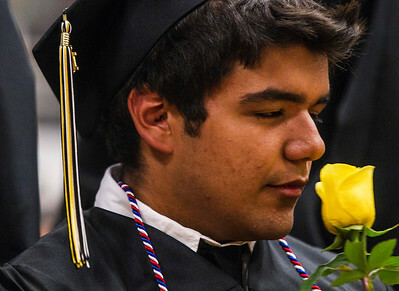 Kyle Grillot - kgrillot@shawmedia.com Graduate Miguel Alvarez smells a rose he received with his diploma during the Harvard High School commencement ceremony Tuesday in Harvard. 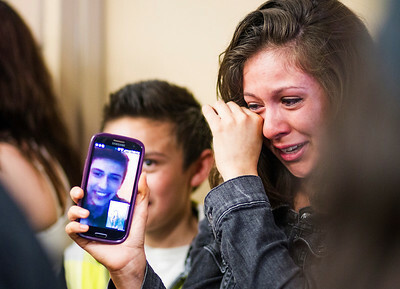 Kyle Grillot - kgrillot@shawmedia.com Teresa Mercado of Harvard wipes away tears while showing her little brother Uriel Mercado Jr. passing graduates as they enter the gym for the Harvard High School commencement ceremony Tuesday in Harvard. Uriel was not able to attend his commencement ceremony because he is currently on a scholarship for an exchange program in Brazil. Kyle Grillot - kgrillot@shawmedia.com Graduate Marlene Orr (right) makes her way towards the gym for the Harvard High School commencement ceremony Tuesday in Harvard. 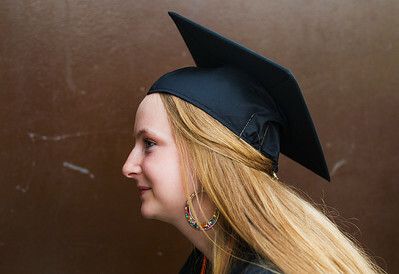 Kyle Grillot - kgrillot@shawmedia.com Graduate Olivia O'Neil adjusts her cap while entering the gym for the Harvard High School commencement ceremony Tuesday in Harvard. 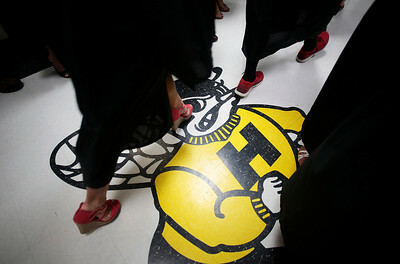 Kyle Grillot - kgrillot@shawmedia.com Graduates make their way towards the gym for the Harvard High School commencement ceremony Tuesday in Harvard. 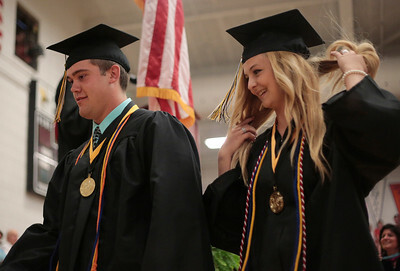 Kyle Grillot - kgrillot@shawmedia.com Salutatorian Tate Miller and Valedictorian Samantha Genz walk to the stage before giving their speeches during the Harvard High School commencement ceremony Tuesday in Harvard. 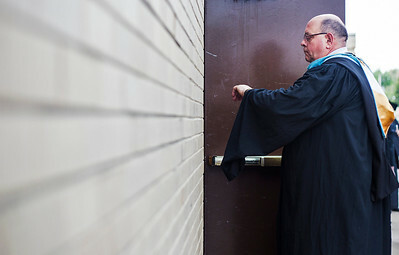 Kyle Grillot - kgrillot@shawmedia.com Assistant Principal John Hollingsworth checks his watch before entering the gym for the Harvard High School commencement ceremony Tuesday in Harvard. Kyle Grillot - kgrillot@shawmedia.com Graduate Juan Carbajal replaces his cap after the playing of the National Anthem during the Harvard High School commencement ceremony Tuesday in Harvard. After graduation Carbajal plans to join the military. Kyle Grillot - kgrillot@shawmedia.com Graduate Trevor Kurth peers out of a window while waiting to enter the gym for the Harvard High School commencement ceremony Tuesday in Harvard. 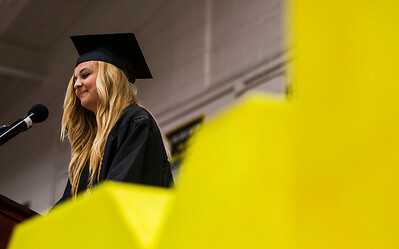 Kyle Grillot - kgrillot@shawmedia.com Valedictorian Samantha Genz gives her speech during the Harvard High School commencement ceremony Tuesday in Harvard. Kyle Grillot - kgrillot@shawmedia.com Graduates Itzell Ribail (from left), Brandon Ricket, Javier Rodriguez, and Gerardo Rivera make their way towards the gym for the Harvard High School commencement ceremony Tuesday in Harvard. 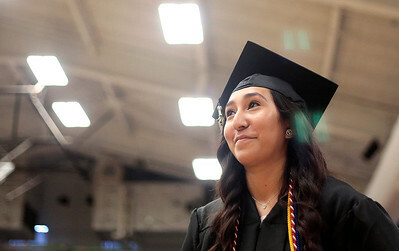 Kyle Grillot - kgrillot@shawmedia.com Graduate Irais Elizarraraz stands to receive her honors award during the Harvard High School commencement ceremony Tuesday in Harvard. 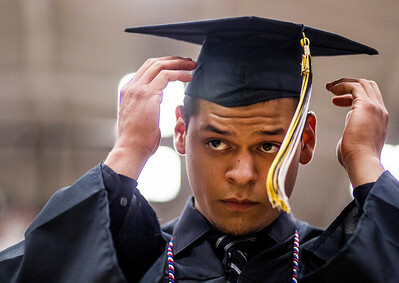 Graduate Juan Carbajal replaces his cap after the playing of the National Anthem during the Harvard High School commencement ceremony Tuesday in Harvard. After graduation Carbajal plans to join the military.